We received this today from our folks at Discovery regarding the issue of Embeds and Deadliest Catch Fan Sites. There have been some recent questions about the use of Deadliest Catch content on non-Discovery websites. Discovery Channel’s policy of allowing fan sites to use embeddable videos has not changed. We value and appreciate our online fans, and are always open to sharing clips with sites that feature Deadliest Catch and our other programming. Our policy does not, however, permit the use of confusingly similar domain names that infringe on our trademarks. This also extends to the use of photographs that are subject to license limitations designed to protect our talent and our brands. We are as committed as ever to our partnerships with our fan sites, and look forward to continuing to work with you and your content needs. 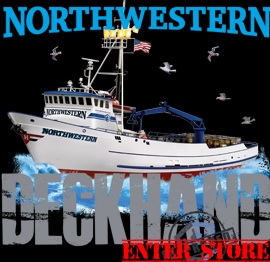 For those that don’t know even we can’t use “Deadliest Catch” in our branding, clothing and/or advertising for Northwestern stuff. While we do use the logo when referring to that #1 cable show Deadliest Catch on Discovery Channel that is the extent. This is also why we avoid editing DC Clips for youtube and using screen captures from the show.